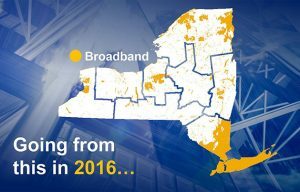 The New NY Broadband Program announced the recipients of its Phase II Grants on Tuesday, February 28th. These grants are the second of three phases in a program which seeks to bring high-speed broadband internet to everyone in the state by the end of 2018 through joint public-private investments in telecommunications infrastructure. The Consolidated Funding Application (CFA) Portal accepted applications for Phase II funding from October 17th – November 30th, 2016. Two Internet Service Providers (ISPs) were awarded a total of $2,672,752 to support projects in Greene County that represent a total investment of $3,378,498. 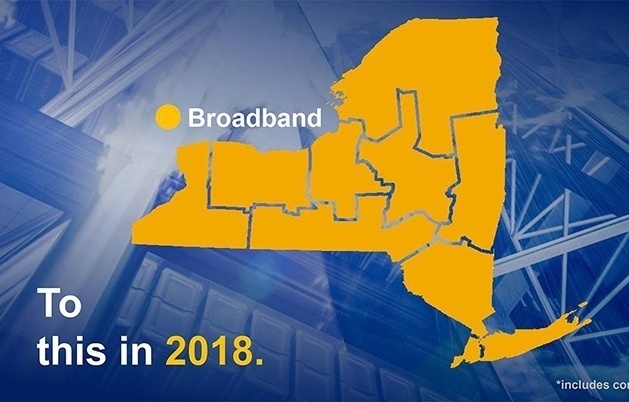 Mid-Hudson Data Corp. will expand access and broadband speed to over 3,600 unserved and underserved residents in the Village of Catskill and the Town of Cairo. Margaretville Telephone Company (MTC) will provide broadband access to over 740 residents in the Towns of Lexington, Jewett, and Halcott who are currently unserved. The New NY Broadband Program Office defines ‘unserved’ residents as those who can only access the internet with download speeds of less than 25 megabytes per second (mps), while “underserved” residents have between 25-100 mps. Greene County Economic Development, Tourism and Planning Director Warren Hart noted that these Phase II grants are part of a continuing effort by the county to create 21st century infrastructure to support economic development and improve quality of life. “This is great news; it’s a high priority for our legislature,” he said. “We continuously work closely with our local providers to bring broadband to both unserved and underserved residents of Greene County”. Hart is particularly pleased with the grants covering Lexington, Jewett and Halcott. These towns have no land-line internet or cable, and rely exclusively on cell-phone service. Business expansion in these mountaintop communities is on the rise, and these infrastructure improvements will have a significant impact. This Phase II funding will bring broadband to a range of census-blocks across the county that currently have no service provider. The yellow shaded areas in the map below detail new coverage in the towns of Catskill, Athens, Lexington, Jewett, Halcott, Ashland, and Prattsville. The Broadband for All initiative of the New NY Broadband Program Office was launched March 2016 to provide broadband to all New Yorkers by the end of 2018 through a series of state grants to private internet service providers. Phase I awards were announced by Governor Cuomo at the Hudson Area Library on August 3rd, 2016 with almost $9 million was going to State Telephone Company Inc. based in Coxsackie, and $1,009,339 to Mid-Hudson Data Corp. Phase I grants enabled ISPs to make major inroads in solving the broadband problem by constructing a “multi-point fixed wireless system,” which uses towers to transmit internet service to dishes on people’s homes, as well as tie into fiber currently running along the Hudson River. The state will begin taking applications for Phase III of the program in the next 30 days, according to the governor’s office. 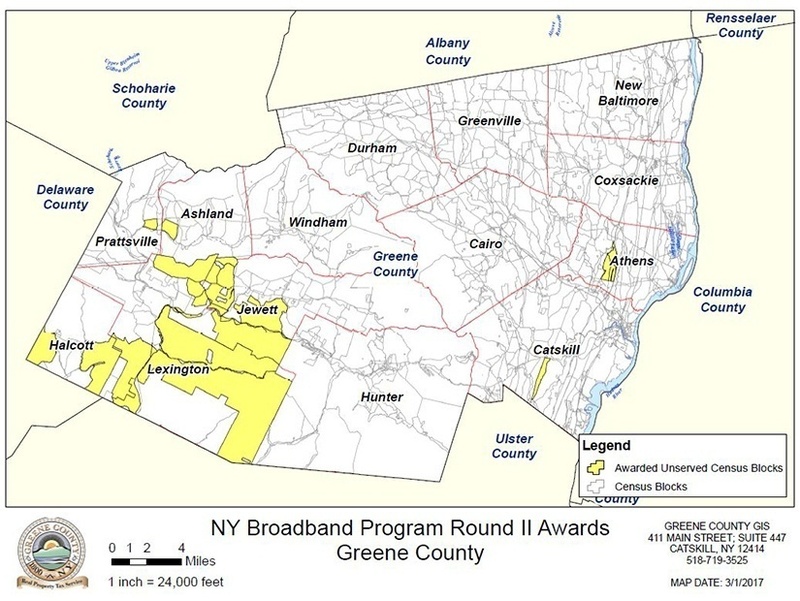 Phase III awards will be funded by $170 million which was originally intended for Verizon Wireless by the Federal Communications Commission’s Connect America Fund to expand broadband coverage in New York. Verizon rejected the money, and it was to be redistributed by the FCC in other states before the bi-partisan efforts of Governor Cuomo, Senators Schumer & Gillibrand, and Congressmen Tonko & Collins petitioned the FCC and secured the funds for use in New York.